While calligraphy is often seen as an integral part of Chinese culture and education, paintings are expressions of beauty and at times, records of events preserved for the appreciation of future generations. 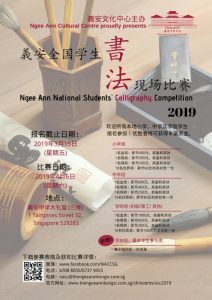 In order to cultivate and maintain this cultural heritage, Ngee Ann Cultural Centre initiated the Ngee Ann National Students’ Calligraphy Competition and Ngee Ann National Day Calligraphy and Painting Exhibition. Ngee Ann National Students’ Calligraphy Competition aims to expose young Singaporeans to Chinese calligraphy. Ngee Ann Cultural Centre strongly believes that the practice of calligraphy writing would enhance interest in the Chinese culture and values. Attractive awards are given to deserving students. To widen their exposure, winning works will be shortlisted to be exhibited alongside prolific artists of Singapore in the Ngee Ann National Day Calligraphy and Painting Exhibition organized by Ngee Ann Cultural Centre in August. National Day Calligraphy and Painting Exhibition is held to celebrate our nation’s independence day. This is also to rekindle and commemorate the spirit of the very first art exhibition held by the then Ministry of Culture in 1969. This annual event invites visual artists regardless of race or religion to share their practices while celebrating the occasion with the joyous juxtaposition of traditional and contemporary artworks. A wide range of calligraphies and Chinese ink paintings, paintings of oil, acrylic, watercolor and various mixed media are on display. What better way to celebrate our national day than to indulge oneself in a visual feast? The annual Ngee Ann National Students’ Calligraphy Competition is back with a new prize category this year. Interested students can download the entry form here. For more information regarding the competition, please check on our facebook.